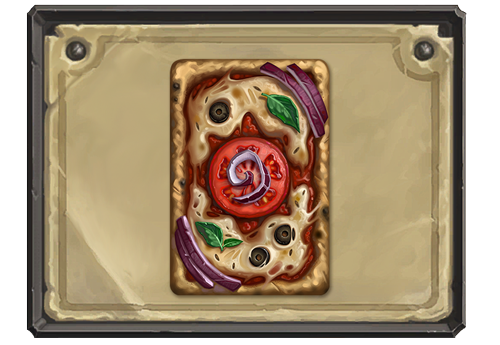 This yummy card back is the reward for playing Ranked games on February. Some times seasonal card backs are good, others they are average and there are times where they are straight up brilliant. I believe the February 2019 falls under that category: looking at it truly makes you salivate and crave for some pizza. My only objection is the olives, because who likes pizza with olives?! As usual, you can earn this card pack by winning 5 Ranked games in either Standard or Wild during February. My only objection is the olives, because who likes pizza with olives?! Purge the unclean in holy fire! A pizza without olives is just all wrong!